Snapchat is a fast-growing photo sharing app — it handles about 350 million photo messages per day — and is reportedly worth $3 – 4 billion. But the company's two founders are being sued by a third man who claims he came up with the original idea for Snapchat but was forced out of the company shortly after its birth. On Oct. 23, more evidence surfaced in a Los Angeles Superior Court against the two current co-founders, Bobby Murphy and Evan Spiegel, as well as their investors. Business Insider got its hands on the filing, which we've embedded below. In February 2013, a South Carolina man named Frank Reginald "Reggie" Brown IV filed a lawsuit against Snapchat's founders, CEO Evan Spiegel and CTO Bobby Murphy. He alleged that he was the company's third co-founder and that the other two ousted him from the company unfairly one month after Snapchat's launch in July 2011. Brown feels he rightfully owns one-third of Snapchat. Now, Snapchat's investors are being sued by Brown as well. Lightspeed Venture Partners, Benchmark Capital, Institutional Venture Partners*, General Catalyst, SV Angel, GC&H Investments, SF Growth Fund, and an unknown entity, THL A17 Limited, are now defendants per the Oct. 23 filing. In addition, Brown's team is accusing Murphy and Spiegel — former Stanford University classmates he once considered friends — of fraud. The Oct. 23 filing suggests a "breach of fiduciary duty," which means that Brown feels Murphy and Spiegel broke his trust. "As a joint venture/partner of the joint venture/partnership, Defendants Spiegel and Murphy at all times owed Plaintiff Brown the fiduciary duties of disclosure, loyalty and care," the latest filing states. "By virtue of this fiduciary relationship, Plaintiff Brown reposed trust and confidence in the integrity of Defendants Spiegel and Murphy ... [they] have breached their fiduciary duties. 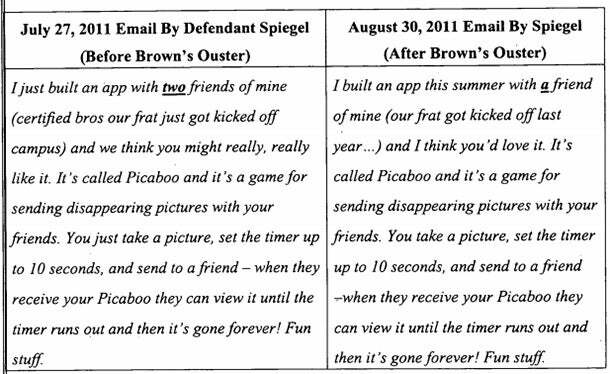 ..."
There's also a text from Spiegel to Brown that says Brown came up with the idea for Snapchat. Spiegel confirmed this in his deposition (testimony), below. But by mid-August 2011, Brown and his lawyers say he was "wrongfully ousted" and that Murphy and Spiegel tried to "cover [it] up." The Oct. 23 filing cites two emails sent by Spiegel, one before Brown was allegedly ousted and one after. The language in each is slightly — yet significantly — different. 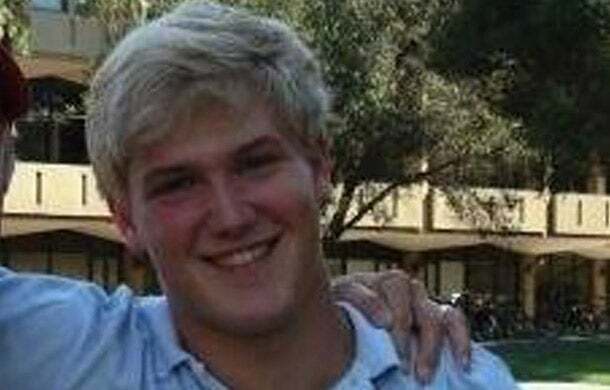 Murphy and Spiegel have not yet responded to Brown's new allegations in court. So far, they have denied Brown's claims in their entirety. Neither Murphy nor Speigel have fully made their arguments against Brown, so we don't yet have their side of the story. We emailed them for comment but did not immediately get a response. Brown's tiff with Murphy and Spiegel is obvious. It's harder to explain why Snapchat's investors are being sued (other than it is customary to name as many potential defendants as possible when complaints are filed in order to cover all possible legal bases). When startups are young, investors don't always conduct thorough due diligence before investing. Investors may not have been aware that Reggie Brown even existed before they cut Spiegel and Murphy checks. Brown's argument is that they did know of his existence and they cut checks anyway. Snapchat's latest round of financing occurred in June 2013, four months after Brown's lawsuit was brought to light by the media. That suggests IVP, SV Angel, General Catalyst Partners and Lightspeed Ventures knew about the lawsuit, and went ahead regardless, investing $60 million. Some of that money should have gone to Brown, he claims. Think of it this way: Someone tries to sell you a house. You know it isn't their house entirely to sell. You ignore the facts and buy it from the partial owner anyway. Technically, you're buying property that doesn't belong to you. That's Brown's argument, anyway. Per the language in the Oct. 23 filing: "Upon information and belief, at the time of its acquisition of these equity shares, Defendant [Lightspeed and Benchmark] had actual and/or constructive notice of Plaintiff Brown's ownership interest in Snapchat." "Upon information and belief, it is further alleged that Individual Defendants each personally profited by over several millions of dollars as Individual Defendants began selling shares in Snapchat to these other Defendants." Ultimately, whether Brown, Spiegel and Murphy worked together isn't in contention. What's in contention is the actual Snapchat ownership percentage Brown was promised — if he was ever promised any. 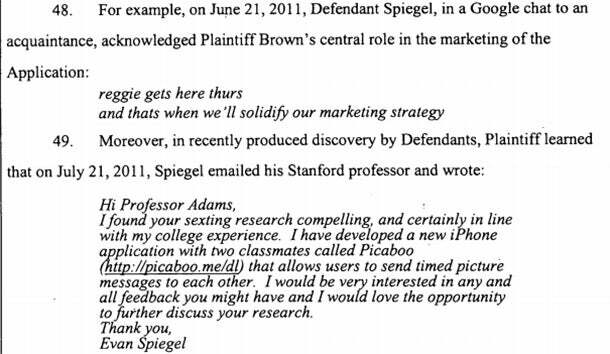 In the filling, it suggests Brown was promised a one-third stake in Snapchat. Unfortunately for Brown, the agreement sounds like it was oral, not written. "At this point, Brown and the Individual Defendants…entered into an explicit oral agreement as to their respective interests in their joint undertaking to develop the Application…That explicit agreement was that their interests in the venture would be equally distributed, i.e. each of them would have 1/3 ownership and profit interests in the joint venture/partnership."